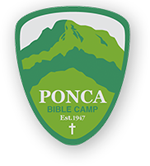 Ponca Bible Camp is a non-denominational Christian Camp located in the heart of the Ozark Mountains, in Ponca, Arkansas. PBC holds six weeks of Summer Camp every June and July. Each week at Ponca Bible Camp is guaranteed to be loaded with God's Word and experiencing His remarkable creation! Campers enjoy area hikes, including Lost Valley and Whitaker Point (a.k.a. Hawksbill Crag), and swimming in the Buffalo National River. High School Camp (Week 1) even ventures to Bull Shoals Lake for a day of water sports and an incredible lakeside evening worship service! All six weeks of camp are blessed with outstanding Christian staff from sponsoring churches all over Arkansas, Kansas and Missouri. Our speakers are Pastors from sponsoring churches, and the camp directors are often PBC Board Members or members of the sponsoring churches. Each week of summer camp has a maximum registration of 90 kids, providing a minimum of one staff member to every seven campers, and many chances for the campers to all know each other by the end of the week! Make sure you check out the rest of this site to learn more about PBC's ministry.